**I can't help it--that little ditty and the freaky purple creature that sings it always come to mind when I see the name "Barney." Yes, the Barney Butter has returned, and in grand form. Not only is it being highlighted in some wonderfully-addictive fudge, but it's also about to make its way into the homes of five lucky readers. Yes, blog friends, five people who comment on this post and tell me their favorite thing to make with nut butter will receive their very own jar of Barney Butter. I'll close the comments one week from today, on March 7th, and then use the random number generator to pick five winners. In a large bowl, microwave the butter and Barney Butter until melted. Stir in the chips and mix until they melt, microwaving more as needed. Fold in the marshmallows and stir until coated. Dump into a greased or lined 9×9 pan, and put into the refrigerator until set. Wow, Im the first? Cool. I love to mix it with water and soy sauce and pour it over noodles. Sprinkle some cilantro on top. A rich, tastey and satisfying meal. Any nut will work! In a small bowl, whisk together almond butter, lime juice, tamari, agave nectar and pepper flakes. Delicious on an Asian style salad. What great timing, as I'm about to make a batch of my favorite savory dish with peanut butter, Szechuan Carrot Soup. While this soup is not nearly as kid friendly as your lovely fudge, adults tend to attracted to the unique mix of flavors. Okay Grace, here's the deal, I've never had anything other than peanut butter which I don't like if it's not mixed with chocolate. So with that said I really need to win one of the five nut butters so that I can give it a try. From the looks of your fudge filled with yummy marshmallows I've obviously missing out! I've never had Barney Butter. I did read about it on another blog though and was intrigued, now I see your recipe and...me want some! I think I'd try the oatmeal cookies first...or maybe mixing it with soy over noodles like Lori said. Decisions, decisions. Ooo looks delicious! And, I'm intrigued by this Barney Butter! I may have to see if my grocery store carries it! i like making a nut sauce, something thai style, and pairing it with peppers, jasmine rice and chicken. mmm. oooh oooh! I like to make...cookies :)! I love to use nut butters in my Holycraptheseareamazing Cookies. I also love them sandwiched between two Ritz crackers and smothered in milk chocolate. Anything with nut butter and chocolate. The possibilities are limitless! Hanging my head in shame ... I have never used it. I used to have a little love affair with butterscotch, but haven't had it in ages. I wish I had some of this fudge now! I've never used anything other than PB, and my favorite thing to do with it is make the chocolate, PB cookies from Magnolia Bakery cookbook. Amazing! Is this a trick question??? Coz if it is I have never tested well... My favorite way is on a spoon! If you need a dish I love a PBJ (peach jam)on wheat bread & grilled in you guessed it BUTTER! jesus that looks good! 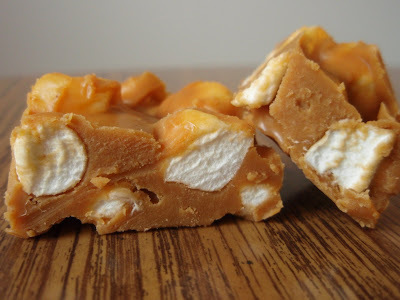 butterscotch fudge? damn. man that fudge looks so so good! hmmm, my favorite recipe with a nut butter....well, i recently made peanut butter blondies that were fantastic. i'll admit that i love "puppy chow"--you know, the concoction of chex cereal, melted peanut butter and chocolate and coated in powdered sugar. yum. but really, you put any nut butter in cookie or fudge form, and i'm good to go. Can i be boring and say I would make some sort of cookies??!!! I think the only thing I've ever had with almond butter is a plain old sandwich with jelly. Boring but delicious! I love eating dried fruit with nut butter. dried pineapple + almond butter = DELISH! Your fudge looks delectable. I wish I had a piece this very minute. Favorite nut butter recipe? I'll have to go with a basic, old fashioned peanut butter cookie which I'm sure would also be delicious as an almond butter cookie. How about barney butter cups instead of peanut butter cups? What a cool giveaway! My favorite thing to make with nut butters is fudge. Delicious! I think I would make some sort of french toast...maybe with bananas. Channel my inner Elvis. Gosh, that fudge looks good. Are those white bits marshmallow? I've never heard of barney butter before. It sounds interesting. The only nut butter I know is peanut butter. I have never cooked with it, other than to make satay. I just like it spread on bread over a layer of real butter. What a yummy treat. Grace! OMG I'm dying to try this Barney Butter! I've only used almond butter one time. But I love that people with allergies can eat this. My sister-in-law can't eat peanuts but now I can make things for her too. Also, I blogged about one of your recipes. I hope you don't mind. I linked to your site too. Check it out. I've never tried almond butter, but I love a pb&j sandwich and a peanut butter cookie. What can I say? I like the classics. I went to the site and saw Barney Butter Cups!! It even sounds cute doesn't it!! Oh geez this is awesome...yowzer...I love Barney! Barney Butter...BARNEY BUTTER...everywhere i turn I see barney butter on all these blogs.How have I lived so sheltered a life, I don't know what barney Butter is? Oh wait, I live in the Sout..that must be it. You proabably can not buy it here, but I NEED to try it. What a tasty treat!! I love PB and almond butter, but my hubby is allergic so I don't get to eat that often...so sad!! There used to be a restaurant that put PB on a bacon cheeseburger and it was my favorite burger ever ... I've never been able to successfully recreate it. I've never had Barney Butter but I'd love to try it out! I would LOVE to try almond butter. My favorite peanut butter recipe is a peanut butter bar with chocolate chips and a layer of melted chocolate on top. Yum. I love peanut-butter-and-chocolate anything...but try not to eat it. So: Here's my low-carb dessert: about 2 tablespoons peanut butter mixed with 2 tablespoons cool whip lite (yes, really) and one 40-calorie fudgcicle. You mix them together, freeze for five to ten minutes and--I swear--it's really, really good and satisfying. I have never heard of Barney Butter so I must say I am very excited at the chance to win a jar to try for myself, My all time favorite thing to make with peanut butter is my infamous peanut butter cheesecake. Hmmmmm... oddly enough, I currently have all the ingredients for your fabulous fudge except the Barney Butter, LOL!! My favorite thing to make with nut butter is a savory dish, Tofu, Broccoli and Sweet Potatoes in a Spicy Peanut sauce from Crescent Dragonwagon's Passionate Vegetarian. ummmm can i have a piece of that fudge?!?!? YUM!! i would be weird and make Peanut Butter Fudge w/the Barney Butter which I guess would defeat the whole purpose huh?? Oh my goodness, that looks like a candy lovers dream! I've never tried almond butter but do believe that I would love it, even more than reliable old peanut butter. I just had a peanut butter malt today... that's my favorite right now. Yum those look great. I like just about any bar or cookie with nut butters--there's a shock. :) Like the Bill Yosses chocolate chip cookie recipe (it's on my blog). Oh Grace - you always know how to make me drool. YUM! Ooooooh Fuuuudddgggeeee! That is a mightly fine looking fudge you got there. Can I have it for breakfast! I love my pb candies the ones rolled in the thick butter cream. You know the ones! I think an "Amazing Grace" patisserie would do very well. This weekend I made falafel and realized that a tahini sauce would have been perfect... if we had it, oy. I've never used Barney Butter before, but would love to try the recipe you posted! LOL.. i had exactly the barney tune in my mind when I read your title!.. since I am asian, i'll stick with my satay sauce using barney butter (in place of peanut butter).. Pick me! Pick me! Oh, random number generator, work your majic! I would love a jar of barney butter to try--in recipes AND straight off the spoon! Thanks for fun giveaway, Grace! Since pea NUT butter is the only nut buttah we've ever had, we're pretty boring about the whole thing. The peanut butter cookies dipped in chocolate were pretty tasty, though. almond butter holds a close place in my heart. I make a blueberry pie recipe that is scented with cardamom, and poured into an almond butter and olive oil pressed crust. My husband and I made these pies every week during our summer of falling in love, and we made them for our wedding instead of traditional cake. yes, almond butter, you are so very dear. Count me out on the giveaway, because it wouldn't be fair for me to win since I've never used any nut butters! I am voting twice! How about a futternutter whoopie pie! Brilliant, SCORE!!! I am in love with this!!!!!!!!!!! I never had any almond butter before, but would like to try it. I like peanut butter in an African peanut butter sauce with spicy chicken. Delicious! Your fudge looks so good. Lord help me, but sometimes I have to have a fluffernutter with a sprinkling of chocolate chips. Um, does sticking a spoon in the jar, getting a big blog and putting in my mouth constitute a recipe??? I just made some great butterscotch dipped Ritz cracker and peanut butter sandwich cookies. Wouldn't they have been great with Barney Butter instead? 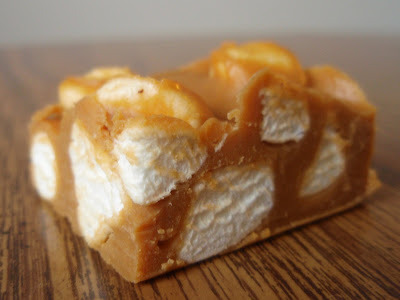 btw -they really put me in the mood for butterscotch and I must say your fudge looks terrific! I love how simple this is. Some recipes have a flavor overhaul, but this is just refreshingly sweet and simple. I love Barney Butter a couple of ways...slathered over hot banana oatmeal and it just melts in...not a better way to start your day. They are also delicious on greek yogurt. Oooo Barney Butter. I've hear a lot about it but have never tried it. I love using crunchy peanut butter in monster cookies...the kind with a load of M&Ms, raisins, chocolate chips, etc. Yum! Is it pathetic to say my favorite way to enjoy peanut butter (and other nut butters) is with a big spoon straight out of the jar. Peanut butter cookies, without a doubt. However, peanut butter on english muffin bread (or just english muffins) is a close second. I'm a big nut (giggle) for cashew butter. My favorite way to eat it is on a big toasted piece of whole grain bread. However, my favorite real recipe to make with it are my Cashew Butter Fudge Terzetto Bars. These layered bars consist of three layers: simple shortbread, cashew butter fudge, bittersweet chocolate, and just a skosh of red Hawaiian sea salt. This is a recipe I personally invented! How about you just mail me out some of that fudge? That looks absolutely amazing. Good God. I want. I want those Barney Butter sandwich cookies. Whoa. Good. I would LOVE to try the Barney Butter! I am experimenting with an Green Tea & Almond Cupcake and I would totally use the BB in the frosting!